You may know the Northumberland Coast Path quite well: ancient castles, fishing villages, stunning beaches and a rugged and rocky coast eternally battered by the North Sea, all make for prime hiking country. There’s a metaphorical carrot dangling in front of every hiking day here, with a wealth of history and intrigue for you to discover. For me, our Northumberland Coast started at Warkworth (with a day to see Cresswell and the beaches between) and then stretched north to the border town of Berwick-upon-Tweed; that is all I knew of this coastline. But I never considered what lay further south from Warkworth and Cresswell. Sunderland is home to the panackelty (a traditional meat potato casserole), and I knew this would be a great walk if the town you start in is famous for a filling and hearty meal – perfect to fuel me for a long day of hiking. I found a signpost for the newly opened England Coast Path on the other side of the Wearmouth Bridge, and followed it down along the riverside path, beyond the city university and National Glass Museum, to the harbour. Beyond, the path danced over cliff-tops and along beaches. Despite leaving a city behind me, I soon found myself overlooking some raw and impressive coastal stacks, with only roosting seabirds and not a soul in sight. This was very much like the Northumberland I knew and loved further north. Soulter Lighthouse stands proudly in the distance - with eroded archways - delicately standing out to sea nearby, making a great place for a quick rest. Entering Newcastle and South Shields was a surprising delight – I knew this place from watching the Great North Run, and even for a cold November afternoon I saw a few runners about, keeping fit and preparing for the Great North Run 2019 (I’ll stick to walking, thanks). Soon, I was faced with the great mouth of the Tyne, and the eerie skeleton of the abbey across the river cast shadows into the rolling mist (from this point onwards, Lindisfarne’s “Fog on the Tyne” was stuck in my mind: "All mine, the fog on the Tyne is all mine"). A ferry is required to span the river, joining the path on the other side as it snakes past a fishing quay (with fresh catches from the North Sea being bought in). My only regret was not stopping at one of the fish and chip bars by the path here for a quick takeaway lunch – imagine how fresh their cod must be! I finally passed the abbey, with the fog now revealing my destination ahead of me, and the coast path wrapping around the bays and rocks. Upon departing my B&B, I saw a small tidal island on the horizon. Not the Holy Island of Lindisfarne. It was the tidal island of St Mary’s, and its 19th century lighthouse, accessible via a causeway during low tide. The views from the top make the short crossing well worth it (bring some binoculars, as seals often like to rest on the rocks here). But no resting for me! 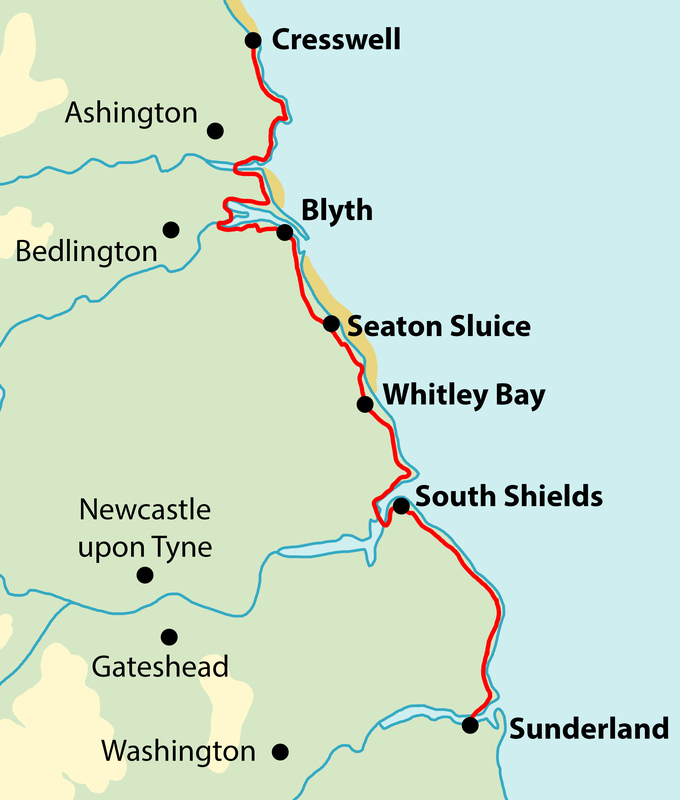 The coast led to the town of Seaton Sluice, and then a pleasant dune walk to Blyth opened up. Here was an example where the England Coast Path can be improvised by following the pleasant sandy beach as an alternative to the dune path, which also heads up into the harbour town. At Blyth, the path takes a detour around the port and pops you out on the wonderful wooden boardwalks at the harbour – sailboats are often moored here, and the bar overlooking the waterfront makes for a nice place to break for lunch (and enjoy a traditional Northumberland “stottie”). After a riverside walk out of Blyth, over a bridge, down through some fields and farmlands, and through a couple of villages, I found myself on a lovely stretch of dunes and beaches at Cambois. The area around Blyth and Cambois played an important role in Britain’s Industrial history, and still does today – however, the path delights when you find yourself on a peaceful beach like here at Cambois. And then it gets better – beyond the next river crossing and over the hill, is the town of Newbiggin-by-the-Sea; a wonderful place beside the bay with a church standing at the end. It isn’t a big town, but the town centre offers all you’d need with some nice shops and restaurants. A nice twilight stroll beside the beach before bed made a perfect end to my day. Newbiggin-by-the-Sea to Cresswell, and beyond. Sunrise! The Northumberland Coast faces east for a stunning start to the day. I watched the day begin from Newbiggin promenade, and set off for the final few miles to link my new Northumberland Coast experience with familiar territory further north. I did have to tolerate the power station early in my day walk, but this is but a short stage to contend with, and opens up a nice reward when you pass onto the wonderful undulating dune path, with yet more untamed coastline to follow. Cresswell marked the end of my South Northumberland adventure – to the north, along the beach beside Druridge Bay, lies familiar ground to Amble and Warkworth. But for now, I think I’ll enjoy an ice cream at Cresswell whilst I wait for my lift home, and remember how much I enjoyed this coast path, and how I can now say the Northumberland Coast is much more than what I originally thought. Enjoy the fresh sea air, changing landscapes and far-reaching coastal views throughout your walk. Hop onto long sandy beaches, undulating sea dunes and meandering cliff paths that link together the towns and villages beside the North Sea. Spot a variety of wildlife off the shoreline, including nesting seabirds and playful seals.